Problems start when a document contains references to external scripts. Any script can call document.write(). Parsing canâ€™t proceed before the script is fully loaded and executed and any document.write() output has been inserted into the document text. Since parsing is not proceeding while the script is being loaded no further requests for other resources are made either. This quickly leads to a situation where the script is the only resource loading and connection parallelism does not get exploited at all. A series of script tags essentially loads serially, hugely amplifying the effect of latency. The ability to 1) load other resources in parallel with scripts and 2) re-order resources to optimize download and rendering times are the biggest performance improvements I’ve heard of from the latest round of browsers. 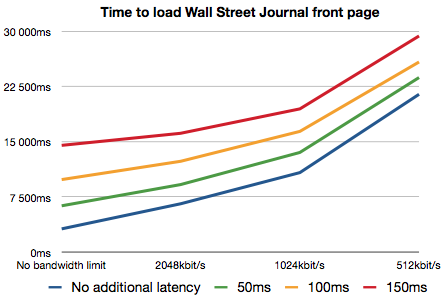 Optimizing downloads (increased parallelization) and fast JS execution (esp. DOM interaction) are the keys to making today’s web apps faster. It’s great to see these teams so focused on performance. This is great news! I wonder what the firefox guys are doing about this. Latency is very important. This is why when downloading a large, single file (such as a software trial) getting a local mirror doesn’t matter that much, as the total time will be much the same. Having a local server for continuously browsing a site with many small resources is of much greater benefit as there is less latency for each request and the site will be noticeably faster.